I love your bag too! I love the extra pockets inside....I bet those pockets keep you very organized! 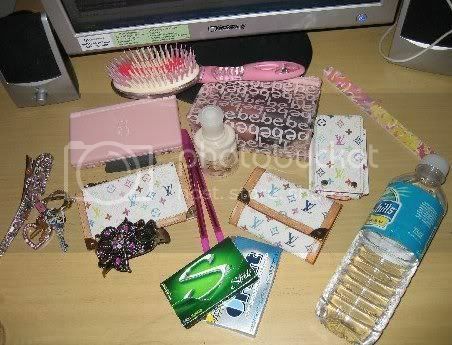 Here is what was in my bag!! i'm emptied it though.. because I doubt you would of been able to see what was in there!! hehe!! And this is what was inside! Not too bad!! 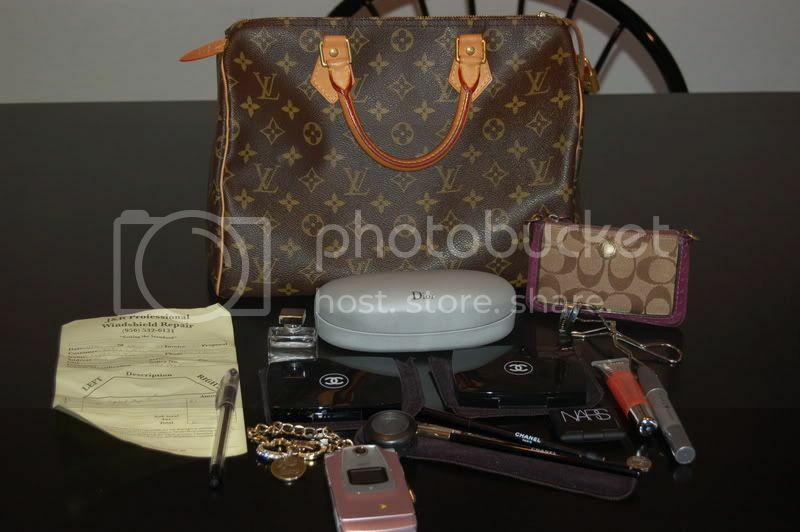 LOL... sometimes my whole dresser is in my bag!!! hehe! Forgot to list what was in it!! Sorry!! LV Multicolor iPod Mini Case... Pink iPod Mini inside! Coach Pink Heart Key Chain with my spare butterfly key!! hehe... I think thats all??? I'm a junk rat pack girl! ha! Even your Nintendo DS is pink thats adorable . . I like all of your multicolores When did you start collecting? Hey!!! I started collecting as soon as the collection came out!!! I got the last Multicolor Pochette at a Neiman Marcus!! 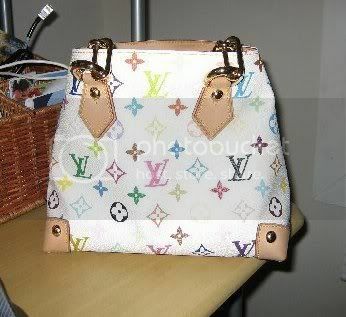 I was like OMG... a Multicolor purse!! As that time is was highly impossible to get a piece of the collection!! So I would say since 2003 I've been collecting!! I need to start buying Black pieces... everything I have is the white multicolor. Next thing I get will def. be in the black!! Both are so gorgeous!! I'm so obsessed with the collection!! Oh and Nintendo rocks!! LOL... I don't leave my house without my nintendo!!! hehe!! Awesome collection...What games do you play on your Nintendo DS? Thank you Thank you!!! Um... well I'm a video gam freak!! I have an older brother.. 9 years older to be exact.. then theres ME! He never would play barbies, dolls, kitchen or any of that stuff with me when I was younger... so it was alway video games or watch sports. I'll literally play anything... my fave games are racing games though!! patisnchz - I think I mentioned on this board somewhere that I got my mk astor at nordstroms, but I was wrong.. .I got it at the downtown macy's. Going to Class! I'm late, ahhh, this is what's in my Lancel School tote. . .
Marissa I have a pink DS too! Do you have Nintendogs? I have a Retriever and a Shih tzu puppy on mine and it's so much fun!! I'm also currently hooked on Brain Training! No I don't have that game!! I heard it's fun though!! Hmmm... maybe I shall get it!